Start with the slide background. Remember, we're adding an animation to the template of the slide not an animation on the slide itself. When you add an animation to the background or MASTER slide, it will play across all slides. Go to the View menu. Choose Master, and then Slide Master. If you want a small animation to play in one corner of all your slides, go to the Insert menu, choose Movies and Sounds... and choose either Movie from Clip Organizer or Movie from File (if you have your own). Place the animation on the slide where you want it to be displayed. Click the Shift key + F5 key to preview your slide. Press the Esc key when you are done previewing it. If you want the entire background to be animated, (we don't suggest doing this for all slides - it will detract from the presentation itself and good design), but you could animate the background of your title slide in PowerPoint 2003. Again, go to the View menu. Choose Master and then Slide Master. Now, go to the Insert menu and choose New Title Master. 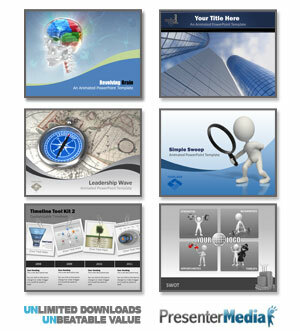 You will need a tiled animated gif - like the one used in the free download above "Starry Background". Searching out on the Net you can find many free animated backgrounds by looking at various search engines. You can also find samples at Brainy Betty by clicking this page. 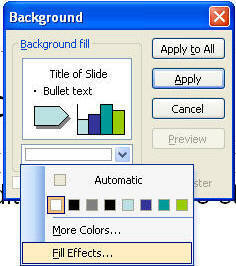 RIGHT - Click on any blank part of the slide and choose Background... and use the Drop down box to choose Fill Effects. Pick the Texture tab and then, the Other Texture... button at the bottom. Navigate in your system and go find your tiled animated gif background. Click the Shift key and F5 key to preview it and choose Esc to end the preview. Save your presentation and go to the View menu and choose Normal to get back to adding content to your slides.